Running a business is hard. And I would argue that running a business as a woman is even harder. According to the World Economic Forum’s World Gender Gap Report, women work on average 50 more minutes a day or 39 more days a year than our male counterparts. And women still carry the bulk of unpaid work — including chores and childcare — on top of their day jobs. How do women find better ways to support each other? How are we able to overcome the guise of competition and instead work to lift each other up? How can men in the workplace become better allies to women in business? How can we as female small business owners find inspiration from the female success is around us? I hope this article offers some answers. Let’s start by talking a bit about the problem. In order to be promoted within a company or to promote our small businesses, first we must learn to promote ourselves. As a journalist, I find it harder to find women willing to participate in interviews, that will in turn position them as thought leaders and emphasize their brands. I’ve heard this repeatedly echoed by event organizers who are concerned with the diversity of speakers and attendees. And anyone I know who hosts a podcast complains how much harder it is for them to get female guests. This is often blamed on “imposter syndrome” — feeling fraudulent, never feeling like an expert or thought leader in your field. Now, according to the International Journal of Behavioral Sciences, not only is this imposter phenomenon equally distributed between genders, but it may be a sign of success. A sense of self-doubt might actually be linked to greatness, as you focus more on personal growth and development. So, we have some of the reasons, but what can we do to support fellow human beings who identify as female? How can we help them achieve success in the workplace? To gain the notoriety they have earned? The Atlantic’s Ed Yong shared with me how he was able to strike balance between male and female sources by tracking it all — as the best way to solve a business problem is often to start by measuring it. He learned that to get one quote for a piece, he has to contact 1.3 men and 1.6 women. This isn’t necessarily fun for him to have more work, but as an ally, he is committed to parity in coverage. I’m doing something similar, by just taking men out of the equation completely. I’ve begun hosting a webinar series talking to just women of influence in their fields. Called WIT: Women in Touch for the women who have their finger on the pulse of their respective industries, I am hoping to also attract more female-identifying guests and listeners of all kinds by keeping it casual and low pressure, focusing wording on conversations with cuppas, not formal interviews. I will also always have at least a few women on the call at a time because a lot of my accomplished guests are frankly uncomfortable being acknowledged for their said accomplishments. The first webinar focused on breastfeeding and the working mom — because nursing is the hardest thing I’ve ever done and juggling with it while running my micro-business or (I think even harder) a more traditional job becomes both extremely expensive and nearly impossible. It’s a conversation most of my mommy friends avoid except in commiserating with other mothers. The modern workplace may try to accept women, but they don’t accept mothers — over time these women earn 60 percent of what their childless counterparts do. I chose this as the first topic because it needs to be talked about more and it is everyone’s responsibility. After all, we all work alongside working moms and they are essential to the future of every sector — including humanity! Other topics include: personal branding, flexible work, mentoring and being mentored, designing a career you love, and an engaging discussion for Black Women’s Equal Pay Day on diversity and overcoming pay gaps. 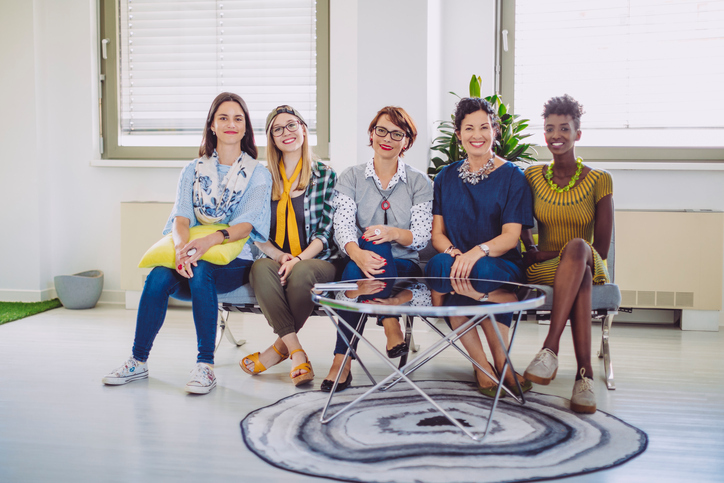 Each topic transcends gender, but purposely highlights women who have a lot to contribute to the space and can get a lot from connecting over conversation with like-minded (female) professionals. But you don’t have to be a journalist or to develop a podcast in order to participate in the conversation. I suggest that you start by asking questions of how women feel at work — the #metoo movement highlights a lot of issues, but so much of our struggles go unspoken. Then, seek to elevate more female thought leaders in your area — seek them out because they have a lot of wisdom to share! And join in this conversation. Share your experiences with one or many women — and if your experience is important to womankind, then consider sharing it with the world! Have you lived through an experience that others could learn from? Think about writing a blog, starting a conversation in a Twitter thread, giving a talk at a local Meetup, or putting yourself up as open to mentoring. Not only does this help others, but it’ll build up your own personal brand. Just don’t be afraid to not only offer help, but to ask for it too! Here’s a small Twitter list of women to watch, as they are both in touch with their topics and their respective communities. Who else should be here? Share who inspires you at @jkriggins and @SCOREMentors. Founder and awesome woman in tech (though she believes identifying with that term further niches us instead of making us the norm), Charity dives deep into her expertise in observability and reliability of complex systems, with a solid mix of advice about mentoring and other ways you can move your tech career forward. Kim is an award-winning journalist, author and a nationally recognized media commentator, consultant and advocate for breastfeeding and infant health. Her feed is full of the journey of balancing being a woman, breastfeeding, working, and embracing black culture. Erica is another awesome woman in tech talking very directly about a mix of pushing for more diversity and equality and just some fun every day life coverage. Her feed also feels like hanging out with a witty friend running through a stream of consciousness. Sadly, there are still too few female investors out there. And too few people of color. Implicit bias reigns over investment for this among many reasons. Ann’s Twitter is a refreshingly honest look at what a small business can accomplish to be exceptional enough to get investment. This is from the woman who invested in Lyft. Sometimes working for yourself as a freelancer takes us to unusual places. For Sam, that’s the South Sudan where she is a rare Western voice writing and tweeting as a war correspondent. Kicking off each day polling what’s offending people, Marie Has one of the most interactive, conversational feeds I’ve seen. She’s a freelance writer (crafting jokes for Jimmy Fallon and The Tonight Show), millennial, and gay rights advocate, along with a former hardline Republican, which makes for a fascinating and brutally honest feed to follow. A criminal justice lawyer who made the pivot to software engineer, Sonia dedicates her social media time to drawing attention to feminist and people of color struggles, not only her own journey but retweeting a lot of others you should follow too. Plus, she takes us through her journey to learn new coding languages and other tricks of the craft. OK this model frankly doesn’t need more followers, but this famous working mom narrates hilariously on a mix of work, pregnancy, parenting, recipes and politics in a way I have to recommend following her. Sometimes we just need to learn to take ourselves less seriously. This isn’t just a feed for Potterheads. It’s much more for the politically minded (especially of Europe) and some really sage writing advice. Yes, she’s one of the richest women in the world (and rightly so) but J.K. Rowling has been through the grunts of the literary world and has huge wisdom to share for budding writers, never talking down to people.